The U.S. Army issued a statement last week saying that Sgt. Bowe Bergdahl did not engage in misconduct during five years of captivity in the Middle East. Bergdahl, 28, of Hailey, was freed on May 31 during a prisoner exchange that also freed five Taliban leaders from a U.S. military detention center in Guantanamo Bay, Cuba. Some critics of the deal that freed Bergdahl claimed last month that he may have been aiding the enemy. The news from the Army indicates that this allegation is false. “We have no reason to believe that he engaged in any misconduct,” said an unnamed Army official quoted in the Washington Post. An investigation into the circumstances surrounding Bergdahl’s disappearance from his post in eastern Afghanistan will not take place for several weeks, after Bergdahl’s team of recovery specialists deem he is ready for the next step. Bergdahl is currently undergoing treatment and counseling at a military base in San Antonio, Texas. He has not asked for a lawyer, and has made no public comments since his return from captivity, the Washington Post reported. Bergdahl has told the military team helping him recover that life in captivity was often difficult and that he was confined to a cage for part of that time. Bergdahl’s hometown of Hailey has no plans to celebrate the soldier this weekend during Fourth of July celebrations. A celebration of Bergdahl’s release scheduled for Saturday, June 28, in Hailey was canceled after concerns arose about overcrowding and potential protests. “We still remember Bowe and look forward to him coming home,” Deckerd said. In a May 2010 interview with the Idaho Mountain Express, the soldier’s father, Bob Bergdahl, thanked activists across the globe who had initiated petitions and awareness campaigns to recognize Bowe and plead for his safe return to the United States. Bob and Jani Bergdahl said they were advocating that the Pentagon and the White House consider swapping one or more U.S. prisoners being held at Guantanamo Bay, Cuba, for their son. Bob Bergdahl said he and his wife wanted to see a peaceful resolution to the standoff, preferably one that didn’t put other American soldiers in harm’s way in order to secure Bowe’s freedom. “We don’t want to see Americans killed,” he said. That wish was answered when Bowe Bergdahl was handed to U.S. Special Forces without a fight on May 31. The celebration planned for last weekend was canceled largely due to a cascade of threats and negative messages sent to City Hall, the Chamber of Commerce and some local businesses. 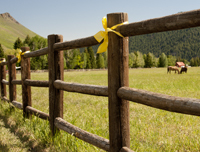 Many yellow ribbons and signs can still be seen around town, showing support for Bergdahl. Bergdahl supporter Debbie Oneill sent an email to the Mountain Express on June 28, the date she had planned to throw a coming-home celebration for the soldier, expressing grief over the negative comments that led to cancellation of the event. “I hope none of them [those making negative comments about Bergdahl] ever have to feel the pain that our community did when our own Hailey young man was taken as a POW,” she wrote.